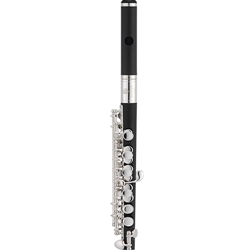 Description: The Jupiter JPC1010 features a heavy resin body and head that mimic the sound and feel of a real wood piccolo. Though designed with a sound for the stage, the resin body allows this piccolo to be played outdoors without the worry of cracks. Features: ABS Resin Body allows both the advantages of great sound and durability regardless of the performance venue ABS Resin Headjoint allows both the advantages of great sound and durability regardless of the performance venue Conical Bore is exceptionally responsive and offers excellent intonation across the entire instrument performance range FREE SHIPPING with your purchase today!